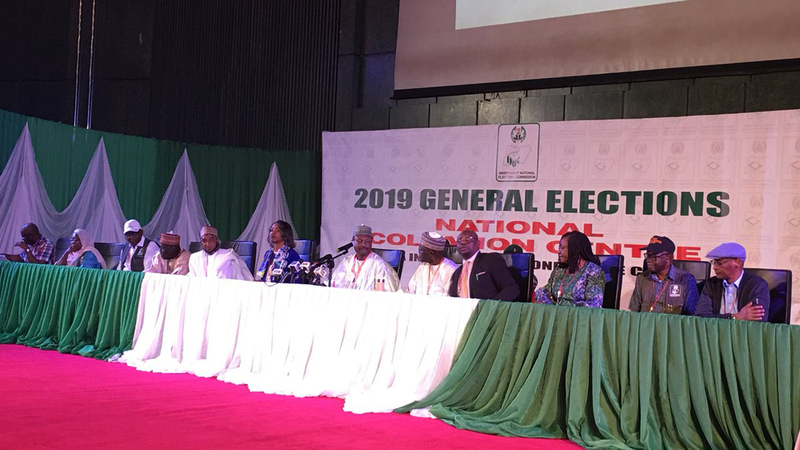 The Independent Electoral Commission (INEC) yesterday adjourned the collation of the results of last Saturday’s elections until 11:00 a.m. today. At the formal opening of the collation centre in Abuja, INEC Chairman, Prof. Mahmood Yakubu, said he was adjourning the exercise because no state collation officer had arrived in Abuja with the results of the presidential election. Agents from the various political parties, election observers and journalists were present at the collation centre . Earlier, Yakubu had told journalists that Ekiti State had concluded the collation process and that the officer was on his way to Abuja with the results. Meanwhile, as Nigerians await the final outcome of the polls, the Peoples Democratic Party (PDP) and the All Progressives Congress (APC) have disagreed over the winner. While the PDP charged INEC to immediately announce the results as delivered from the polling units and declare its candidate, Atiku Abubakar, the winner, APC said the PDP’s victory claim was baseless. “Intelligence available to us is that INEC is delaying the announcement of results following directives by the Buhari Presidency and the All Progressives Congress (APC), which are bent on altering the figures from the polling centres and allocating fictitious figures for President Muhammadu Buhari, particularly in northern states. “Curiously, INEC server is now shut down, results are no more being transmitted and the reason is to enable the APC to inflate figures from six designated states,” PDP further claimed. The opposition party called on international observers and election monitors to insist on a transparent process of transmission of results and the monitoring thereof. “We already have reports of how APC governors in the northern states have been making desperate effort to tamper with the results of the elections in their respective states with a view to awarding conjured votes to President Buhari,” it added. PDP said it was aware of frantic efforts being made by a north central governor to change results to suit APC’s purposes as against the wishes of the people, expressly delivered at the polls and how a minister used the military to hold an INEC official in River state, Mrs. Mary Efeturi, hostage and insisted that she would not be released until she altered the results in favour of Buhari. The party said the INEC chairman must note that in this age of Information Communication Technology (ICT), Nigerians already had the results as delivered at the polling centres and any attempt to alter any figure would be faced with vehement resistance. “In delaying the announcement of the results, Yakubu is allowing the APC to turn him into a villain and directly pit him against the people. He should, therefore, extricate himself from the rejected APC and be on the side of the people, by immediately announcing the results as already delivered at the polling units and declare, the people’s candidate, Atiku, the winner. “Anything short of this is not acceptable to Nigerians, who had already expressed their wishes and aspiration at the polls,” the statement further read. Also yesterday, Atiku declared that with the results collated so far, he was sure of winning the presidential election. The PDP candidate who spoke through a statement by his Special Assistant, Public Communication, Phrank Shuaibu, said that “with the PDP’s high tech, cloud-based SVC system – which is able to collate in real-time the results from the 176,000 voting points across the nation, he could boldly assure his supporters that victory was at hand. “The people of Nigeria can take solace that very soon the living nightmare of the last four years will come to an end so that together we will get Nigeria working again,” he added. Atiku urged Nigerians to be vigilant in the next 48 hours to prevent the majority votes recorded at the polling units from being disrupted by APC forces at the collation centres. “I am familiar with how brazen and the complete lack of shame the APC can exhibit, but even I was shocked to witness just how low they went last night by accusing the PDP of ‘recruiting armed thugs’ to do just that. Why would we want to do that when we are winning? But APC described the victory claim by the PDP as an unwarranted assault against the tenets of democracy and the people of Nigeria. APC, in a statement by its National Publicity Secretary, Malam Lanre Issa-Onilu, said the stance by the PDP was shameful and alarming. According to the ruling party, the PDP should live up to its acclaimed status as a large political party by behaving more responsibly instead of acting the role of spoiled children who threaten to upset the dinner table if not fed with their preferred meal. The APC charged INEC to do its job as mandated by law and by good conscience and not by the screams of those who do not fully believe in democratic ideals. “We also ask our members and supporters to exercise patience and conduct themselves peacefully. Democracy is a contest of issues and visions. Not one of muscle and fighting. Let there be no more violence among us. Remember that we are all Nigerians and belong to the same national family despite our political differences. “On this day, may democracy and sovereign will of the electorate reign. There is no worthy substitute for this despite the malign protestations of the PDP. “If Nigeria is to stand for something, let it be democracy and let it be today so that we assure for ourselves fruits of a brighter future. “Our nation is trying to perfect its democracy, not turn it into a mockery. Sadly, this objective is lost to the PDP. The PDP’s guiding principle is distilled to the following; because they want something, then they should get it. What they use to guide themselves actually blinds them instead. “Because they want the presidency so badly that they have engaged in all manner of misconduct and spared little cost to achieve their aim, they now believe that they are entitled to claim victory notwithstanding the vote and will of the people. But this is not the way of democracy. Democracy means the people choose for themselves not that the PDP chooses for them,” APC said. According to the ruling party, while all evidence point to the misconduct of PDP supporters, they make outlandish and false claims against the APC. “They seek to distract the public eye from their own wrongs, by falsely accusing the APC of the very things they had conspired to set in motion months before this election even took place. From trying to falsify results on the ground to attempts at hacking the INEC software, they are willing to say and do anything to obtain victory, no matter how tainted by the wrongs they commit. Meanwhile, an election observation group, Centre for Transparency and Advocacy (CTA), yesterday claimed that the Nigerian armed forces interfered in the elections. The group, which addressed journalists in Abuja, said there was much to be desired in the deployment and conduct of the security forces during the elections. The group also claimed there were cases of men of the armed forces preventing election observers from performing their legitimate duties even after proper identification. In some cases, they said they had reports of voters being turned away from accessing their polling booths as was reported in the riverine areas of Delta State where waterways were blocked. Faith Nwandichi, Executive Director of CTA noted that in most of the polling units where its observers were deployed, reports indicated an early arrival of security personnel at the polling units. She added that in most parts of the country, security agencies were also deployed and present at the polling units. “However, we observed during the elections, that areas identified by ICRC as flash points had light presence of security agencies,” she added. The CTA commended Nigerians for their determination to ensure the success of the elections in spite of challenges and difficulties in most parts of the country. “We salute every Nigerian for braving the odds in spite of the difficulties. Recognising the challenges which culminated in the suspension of the elections of 16th February, we commend the leadership of INEC for the frameworks and mechanisms it put in place within a very short time in ensuring that the election was held on Saturday,” she said. CTA disclosed that reports from its observers deployed across the country indicated that the elections were still marred by challenges ranging from the late arrival of materials and personnel to malfunctioning of card readers, shortage of sensitive and non-sensitive materials, pockets of violence in some states resulting in killings and disruption of voting, missing names of registered voters from the electoral register and poor management of RACS on the polling day. Yesterday, it was alleged that the spokesman of the PDP Campaign Council, Buba Galadima, was arrested by operatives of the Directorate of State Services (DSS). Galadima, a supporter of Atiku and front man of the Coalition of United Political Parties (CUPP), has been a fierce critic of President Muhammadu Buhari since he fell out with the party leadership in 2018. However, the DSS has denied arresting Galadima. Keyamo said: “Our information is that they aim to create crises and confusion that will lead to Alhaji Atiku Abubakar claiming victory in a day or two from today ahead of the official announcement of the results by INEC. Besides, like Godswill Akpabio of Akwa Ibom State, Bukola Saraki reportedly lost his senatorial seat. The acclaimed strong man of Kwara politics and current Senate President, Saraki, lost his senatorial district to the APC candidate, Yahaya Oloriegbe. In the four local government areas that constitute the Kwara Central Senatorial district, APC polled a total of 123, 808 votes while Saraki’s PDP polled 68, 994. This partially brought down the political hegemony of Saraki which the opposition party had desperately desired to deflate. The APC mantra of “O to ge” (enough is enough), which has really become manifest in the battle for the soul of the state, would be more pronounced at the governorship contest a couple of weeks ahead. It was the first time the Sarakis would be losing an election in the heart of Kwara in decades, as his father, the late Dr. Olusola Saraki, dominated the political space in Kwara before his demise, handing over the structure to Bukola, the most politically vibrant among the children. The “O to ge” slogan implies rejection of Saraki’s political leadership, which the opposition had said brought nothing but poverty, tokenism, underdevelopment and gross infrastructural deficit into the state.